I walk every day. Is that enough exercise? To simply begin rounding out your exercise program,however, aim to engage in some type of activity 3-5 days a week and then add in some resistance and flexibility exercises. 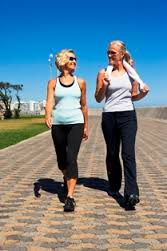 If you are new to exercise, start small, then slowly over time increase your overall amount of activity. Pick activities you enjoy. If you are having fun, you are more likely to stick with it and start to notice your progress!